Alaia (http://vimeo NULL.com/15613970) from Hydrodynamica (http://vimeo NULL.com/user4721466) on Vimeo (http://vimeo NULL.com). This has to be one of the purest forms of surfing and this video makes riding an alaia look pretty easy but it certainly isn’t… When I first saw videos of people riding such simple finless wooden boards I instantly new I had to build and try one. They’re darn difficult to ride, especially if you’re not built like a stick insect. Learning to paddle and stand up is a full mission in itself, however when used as a simple body board they’re way easier but still an absolute hoot, just perfect for those smaller summer low tide closeout barrels. 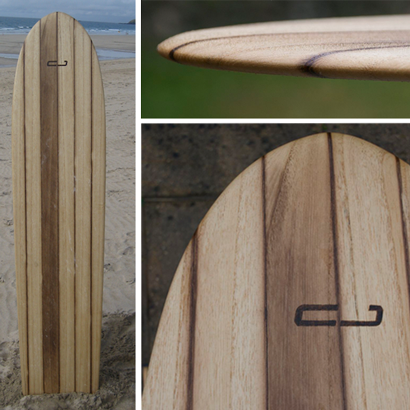 I’ve made these out of both paulonia and red cedar; the board pictured here is made from beautiful weather edged paulownia sourced from maverick surfboard builder Roy Stewart (http://www NULL.olosurfer NULL.com/) via Loose Fit (http://loose-fit NULL.co NULL.uk/) in Devon.